← The Super Organizer Answers The Proust Questionnaire. Super Tip Tuesday- A Solution To Cables and Cords In Your Way! 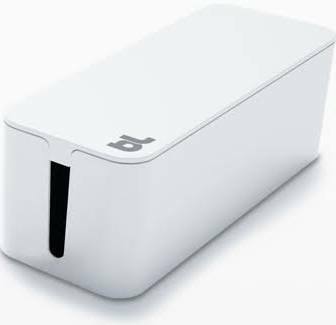 A Client of mine introduced me to this, Bluelounge CableBox Cable Management Box She was tired of tripping on her cords in her home office. Under or on the desk, next to the computer, or behind the TV, loose tangled cables are always untidy dust traps. CableBox is the solution to solve these issues. Simply place your power strips or surge protector inside CableBox. No need to unplug anything first. Then stow away the surplus cable lengths, close the lid and done. 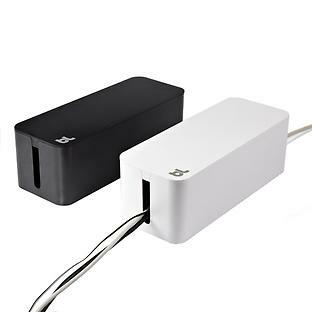 Designed with cable outlets either side of the box, CableBox will fit almost every size power strip with extra space for the cords, adapters, etc. You can find this product at several major retailers like Office Depot and The Container Store. It prices for about $30 bucks. Online or in-store.